The Mahan on their team got so mad he killed them all. I died early cuz Pensa is made of citadels ofc. i really hope that mahan didnt do that team kill. Which reminds me, since 0.5.5, I have seen a lot more pink players than usual. The new system of TK recognition must be on overload. Next to the mahan's name is -3....That's not his bank account.... He killed the lot. Did you submit a ticket for this... player? It seems there is still a considerable amount a tweaking to improve on the current TK system if a player can wipe out a 1/4 of the allied team and not get a sanction. I said a Quarter of the allied team! True. 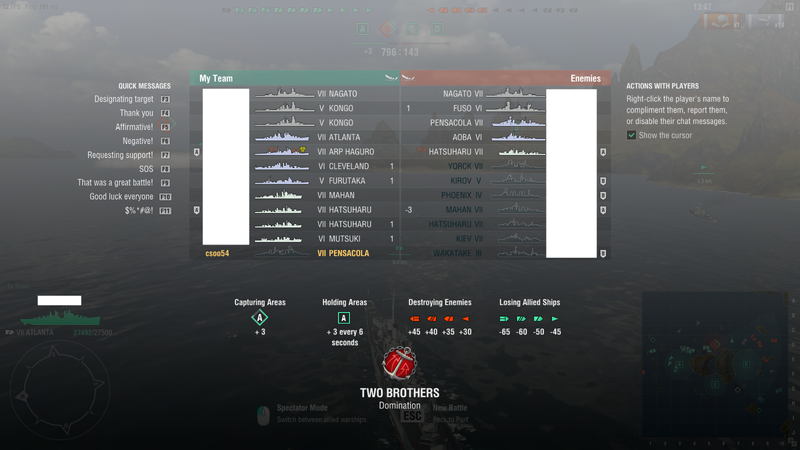 Last night i was in a match where a kongo div with tenryu and got pulled ibyo a tier 7 match.